Paradise Pavilion at Ladera, St. Lucia The stunning view of this Caribbean island’s iconic twin Piton peaks hasn’t changed since this serene, 32-room resort opened, but the recent addition of this 1,200-square-foot, open-air (yet sheltered) wedding venue means couples and their guests can enjoy it in private. Set along the same rainforest ridge as Ladera’s romantic plunge-pool suites, with unobstructed panoramic views of the Pitons and the sea, Paradise Pavilion (see photo, above) accommodates up to 100 people for a sunset ceremony and reception – catered by award-winning chef Orlando Satchell of Ladera’s Dasheene restaurant – and guarantees memorable wedding photos. It is linked via landscaped stone pathway to Hilltop Dream Suite #X8, which serves both as a bridal party dressing room and post-party honeymoon suite. For a wedding of approximately 80 guests, couples can take over the entire resort. Rooms from $380; for Wedding Packages and Paradise Pavilion rental rates, contact weddings@ladera.com. 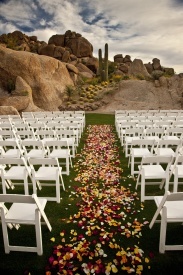 Promise Rock at The Boulders Resort & Golden Door Spa, Carefree, AZ Nature provides a magical altar at the made-for-sunset wedding venue recently added by this pampering resort and spa with 160 casitas and 61 villas located just outside Phoenix. Against a backdrop of 12-million-year-old golden-hued boulders, a trickling waterfall and an abundance of cacti – including a pair of giant “his & her” saguaros – couples can marry in front of up to 250 guests (see photo, right). The site, a grassy meadow set at 2,288 feet and offering dramatic vistas of the Sonoran Desert and the resort’s emerald fairways, is part one of a celebration that will carry over into one of The Boulders’ many special events venues, some with patios and fireplaces. Rooms from $149; for Promise Rock venue and catering rates, email erin.maguire@theboulders.com. Couples seeking a one-of-a-kind setting for intimate “I Do’s,” can now book the “Cloister Wedding Celebration” to marry at the ivy-wrapped 12th-century Augustinian Cloister (shipped piece by piece from France – see photo, left) at this elegant and easy-to-reach Bahamas resort. The package includes a five-night stay for the couple – plus all ceremony-related details such as license, officiant, venue fee, bridal floral and photographer – and allows a maximum of 10 guests to attend the ceremony. Also included: a champagne turn down, a Caribbean Awakening Spa experience for two and a dining credit of $400. If you’ll be celebrating with friends, a dinner reception can be arranged at either Dune, Jean-Georges Vongerichten’s seaside restaurant at the resort, or the alfresco Courtyard Terrace. Rooms from $495 and five-night Cloister Wedding Celebration for two, from $8,093; for more info, email celebrations@oneandonlyoceanclub.com.